This impressively six-track debut from Boston's CORTEZ hints at good things to come. They write memorable songs; they have a filthy and mean guitarsound while the rhythm group is a solid unit and at least the pleasantly rough vocals fit perfectly to this massive groovy sound. Each one of the six songs demonstrates this principle with deadly effect, while the powerful and thick production is making everything just more perfect. 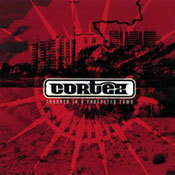 CORTEZ have done a good job here and it's almost impossible to pick out outstanding songs. It's also very nice, that they have integrated enough diversity into their heavy sound so that this disc manage to keep your interest not only for a day or two. Here you won't be bored from always the same groove or the same pace. It's hard to believe that this band has been formed in 2006, because this debut sounds as if they've been together for almost ten years. If you're lookin' for a thunderous combination of 70's Hardrock and classic Heavy Metal than you should add CORTEZ on your list. My anticipation for their first full-length is huge, because this is really good music. Thanks to Buzzville Records for delivering one of the first highlights in 2008!